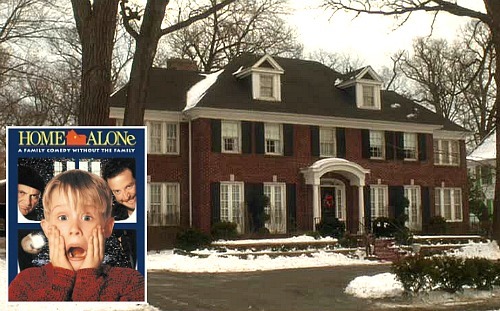 The Home Alone movie house has always been one of my favorites, so I was excited when a reader named Eric shared photos he took inside the real home in Winnetka, Illinois, with me. He says the owners were kind enough to allow him to take these in 2004. Let’s see how they look compared to the rooms that were recreated on a soundstage for the movies! Let’s take a look at the entry first. The above photo is how it looked in Home Alone 2. Below is a snapshot I took in the original movie. 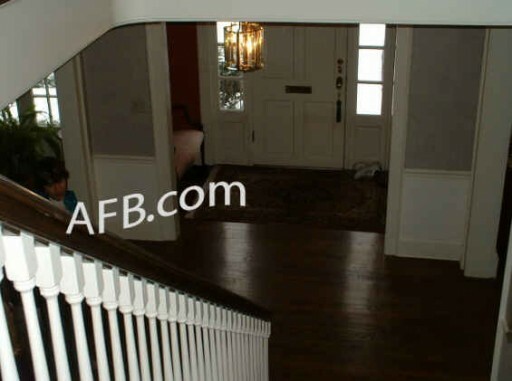 Notice the changes they made, like how there are fewer family photos on the wall going up the stairs? 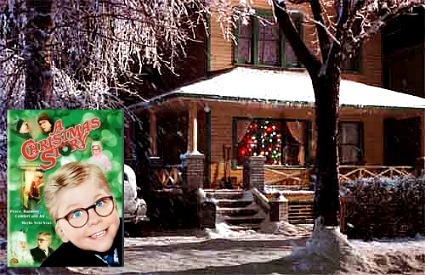 Macaulay Culkin points out in the DVD commentary that in real life he would have crashed into the wall if he really attempted to sled down the stairs and out the front door. He didn’t get any photos of the real kitchen, but you can see it and more rooms here. Despite the resemblance between the actual rooms and the ones in the films, few of the interior scenes were shot inside the real house. Director Christopher Columbus talks in the DVD commentary about recreating the interiors on a sound stage in a high school gymnasium, and a source tells me that they used the nearby New Trier High School, which was vacant at the time. Ceilings appear to be 8′ in the actual house but are taller in the movie. The foyer is reportedly wider in the movie, too. Thanks to Eric for sharing his photos and floor plans with us! UPDATE: The “Home Alone” house went on the market after I wrote this post and you can see more interior photos of the real interiors here. 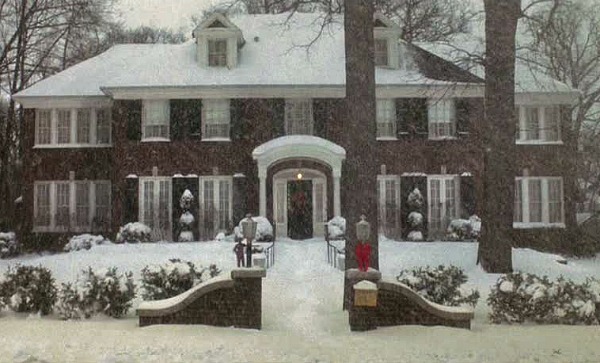 Is this one of your favorite Christmas-movie houses, too? Can You Name These Christmas Movies? 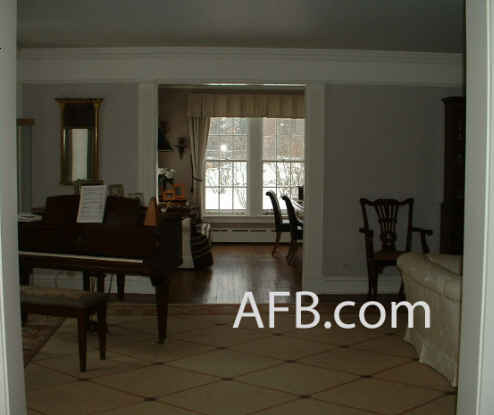 This is a lovely and grand home, prefect for holiday parties! .-= The Stylish House´s last blog ..Christmas Mantle Swag Tutorial =-. I watched this movie over the weekend and remembered you previous Home Alone house post, so I was surprised to see another post today. Love your blog. .-= Emily B´s last blog ..new goals =-. WOW, what fun! I have always loved the “Home Alone” house…thanks for the really informative trip through it (and the sets they used for the interior scenes). I think the set design was stunning. What does it say about me that I absolutely love red and green, and the Christmas decorations make me innately happy…yet I’m Jewish? LOL!! .-= Cynthia S´s last blog ..Finally we’re HAPPY to see water! =-. Julia, I love your blog re-design. It is lovely — just like you! .-= Bonnie´s last blog ..More Flowers =-. I love the wall paper in the entry and stair well. .-= Janet´s last blog ..Recycled Homes =-. .-= Stephanie´s last blog ..The Christmas Card That Wasn’t =-. We will always love this house! .-= Celebrity Digs HQ´s last blog ..Neighbors at Legal War Over Rihanna’s Big Move =-. P.S. Love the new look of your blog! That’s ALOT of potatoe flakes ! You just made my day. 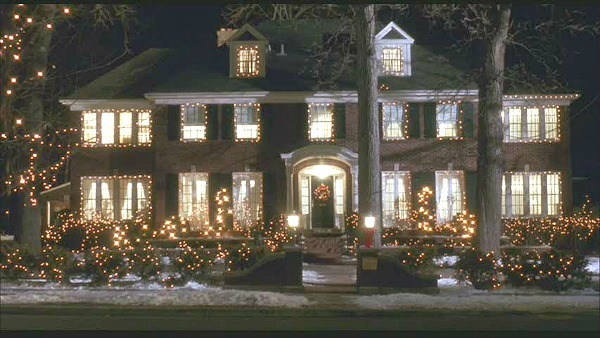 I loved the Home Alone house from the moment the movie came out (I was in high school). Thank you for the inside scoop!!! .-= Maria Hanson´s last blog ..It always tastes better in a tea cup =-. I have a suggestion for another movie house I’d love to learn more about: the house from Beetlejuice. That house is beautiful! I never really payed much attention to it before, but wow! Talk about curb appeal! .-= Shannon´s last blog ..Reindeer Burlap Holiday Pillow =-. .-= MissCaron´s last blog ..HAPPY THANKSGIVING! =-. Ask and ye shall receive! Thanks! I am definitely going to head up north and check it out one of these days, probably after the first snow so it looks all festive and cozy! Well, Siskel and Ebert were wrong, huh? That’s one of the best movies of all time (the first one)! And I always *loved* the house. Thanks for sharing the info! Very interesting. .-= Carmen´s last blog ..My attempt at a Thanksgiving centerpiece =-. I just watched 1 & 2 this past week with my family on Thanksgiving. I’m so glad you shared the house, because it’s one of my favorites. Strangely I love the movie interior better even with all the wallpaper. Have you done the Christmas Vacation house yet? .-= rue´s last blog ..My mom’s Thanksgiving tablescape =-. This post ROCKS! This film is just a classic and that house is so beautiful. .-= Jocelyn Stott´s last blog ..Thanksgiving Quick Recap =-. .-= the BLAH BLAH BLAHger´s last blog ..Thanksgiving Wouldn’t Be the Same Without You =-. I grew up just about 4 blocks from there. My parents still live not too far and my sister is now moving into a house that was built on the property that my parents house was located. I am still not too far from there but more than the 4 blocks from where I grew up. It is a beautiful house as are a lot of the houses in Winnetka. I have already watched Home Alone this year!! I got an early start! Loved this post! Love that house! .-= Lou Cinda´s last blog ..It’s Beginning to Look Alot Like Christmas! =-. This will always be one of my favourite movie houses. And I absolutely love the look of the house with NO wallpaper, haha. And is it just the lighting, or are the floors darker in the entrance area of home? Comparing the two pictures, the floors in the movie are a lot nicer. First of all, I LOVE your new look!!! 🙂 I’ve been out of town and didn’t have a chance to catch up while we were away. It looks fab! .-= Amanda @ Serenity Now´s last blog ..Tennessee Playhouse Cottage =-. I love this movie and the house. 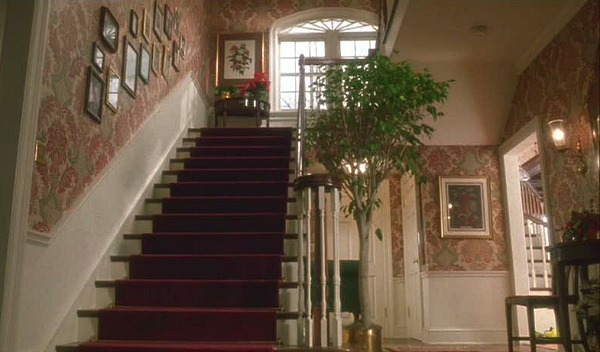 I read that they paid the people something like $100K to use the house, and then they came in and did all the wallpaper we see in the movie because the owners didn’t have wallpaper. Then after the movie, they came in again and took it all down. Maybe they put it up again for the next movie? 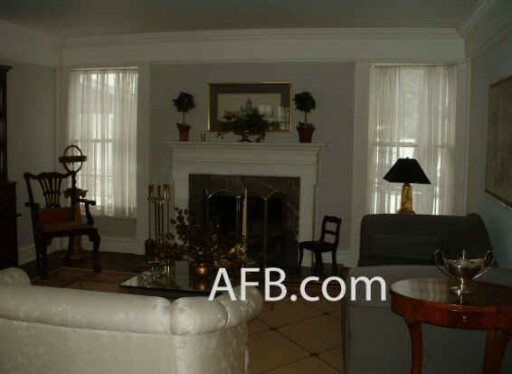 I loved seeing the real interior shots, Julia… what a difference from how they decorated the set!! In fact, for such a beautiful house (exterior), it was interesting to see plain white walls. Too bad, really!! Fun post! Brought back memories of my son (now 22) doing the Kevin scream – hands on his cheeks and hollering at the top of his lungs! .-= Victoria @ DesignTies´s last blog ..Visions of Sugar-Plums… (or “The Best Way to Avoid Your Homework”) =-. loved reading all these behind-the-scenes secrets! 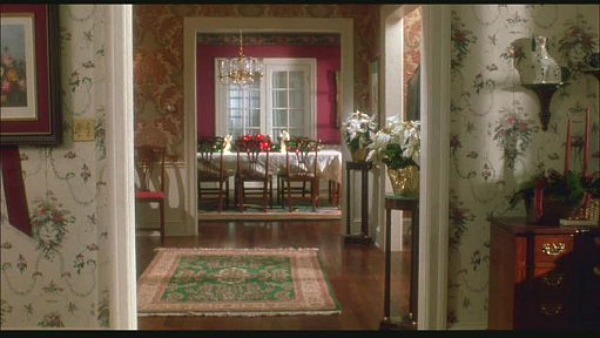 i love how they used red & green decor to give the right vibe for a Christmas movie. gerat post & the new header is awesome!!! .-= Lauren Liess´s last blog ..Forcing Paperwhites/ Narcissus Bulbs =-. I’ve always loved that movie house! I don’t think that guy looks like Elvis though, not at all. This is one of my all time favorite movie houses. Thanks for posting this! I can’t believe how similar the actual home is to the the sets. I would love to live in a house like that. These are the best Home Alone movies ever made. The other Home Alone movies aren’t that great. I LOVE the home alone house! I wish I could decorate like that! I think that is my favorite movie house…the 2nd is the father of the bride house! Thanks for sharing! .-= Jen @ After The Alter´s last blog ..Stuffed and Satisfied! =-. .-= boysmum2´s last blog ..New Meaning =-. Hi Julia, I just love this home,and all the rooms inside. I was just wondering if there is a house plan out there somewhere on this house, so far I haven’t seen one that is close to it yet. I’ve looked at soo many plans now, they’re all staring to look alike to me. I think I need a break from looking at the plans. Great post, Julia! I do love this house; think it’s one of my all time favorites! .-= Jacki´s last blog ..Garage Sale Treasure and Tagged =-. This is so cool and I too Vote on this being right up there among with the favorites of movie homes. ~? .-= Beth at Aunties´s last blog ..My Simple Day Book Post =-. What a cool blog post! I watched this movie so much…love the house! .-= Stephanie´s last blog ..Destination Canvas…. Where have you been? =-. I loved this movie! Seeing the floor plans really shows you just how big this house is, and it is beautiful! Funny how I notice now just how much wallpaper was used in the house/set. 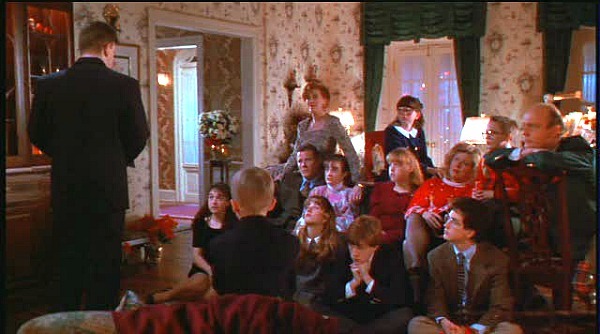 My favorite Christmas movie ever, and yes, it has lots to do with the house!! LOVE this movie! I can’t imagine how it ever got two thumbs down. I think it should come back to the theater! I never saw it on the big screen! ps – I want this house! .-= Angela´s last blog ..Anniversary =-. It’s so funny that you put this up! 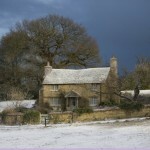 I had read your post about suggesting some holiday movie homes, and this one came to mind! So fun. Love your site, keep up the great work! .-= susan´s last blog ..Christmas Under Glass…A Holiday Cloche Party =-. Thank you, thank you, than you!!! At last, a plan of the house! I absolutely love the film and this house. 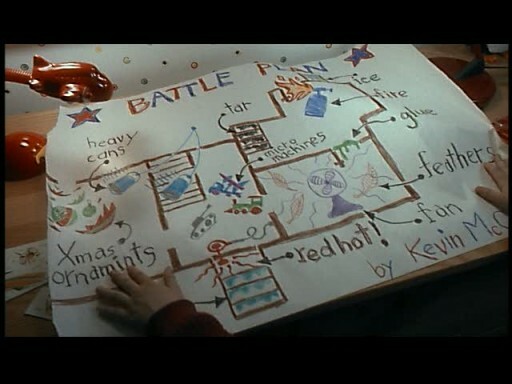 Home Alone comes out every Christmas to get me in the festive spirit and for the last three years I’ve ended up pouring over bits of paper trying to draw out the house plan. I could never quite work out the upstairs but my downstairs attempts seem pretty close. I love your page. I am looking for gold angel candles just like the ones on the dining room table. Would anyone know where I can find them? Thank you. Happy holidays. I would like to know where to purchase those candles as well, I have admired them for a long time. I’ve always admired that house. Home Alone is my all time favorite movie. I’m fairly sure that house was used in Planes Trains and Automobiles as well. It was Steve Martin’s house. 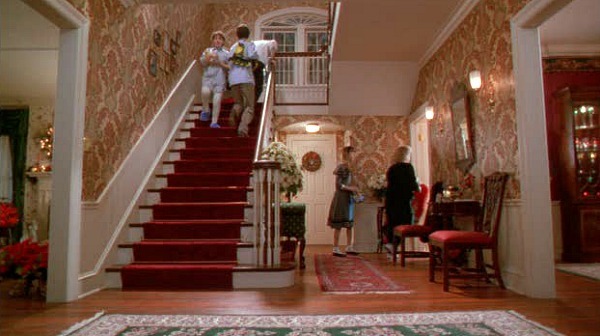 They showed the foyer in the final scene & it was totally different from the Home Alone decor. 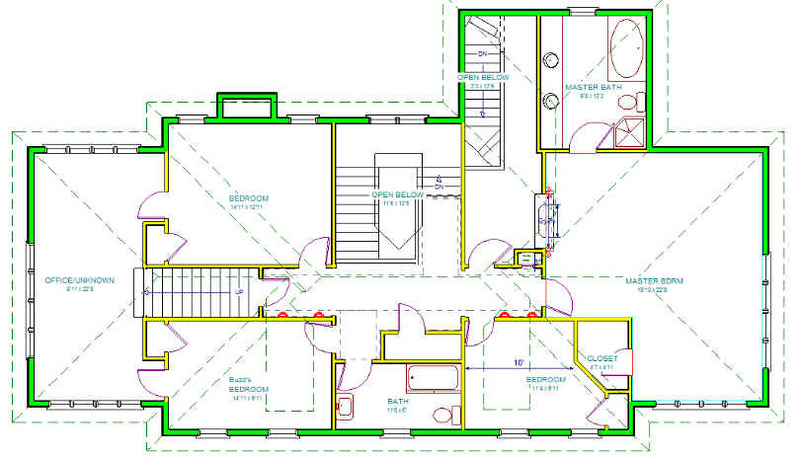 Thank you, I was looking for this house plan since a long time. I loved the film and i’d like to build this house for my sims. Sorry if my english isn’t perfect, i’m french. I followed a link over from Nester and I am LOVING this post. Home Alone was one of my favorite movies growing up. .-= Jamie´s last blog ..Goodbye Aughts =-. The bathroom is off Jeff and Kevin’s room (bedroom with the bunk beds). The bathroom also has a door to the hallway. 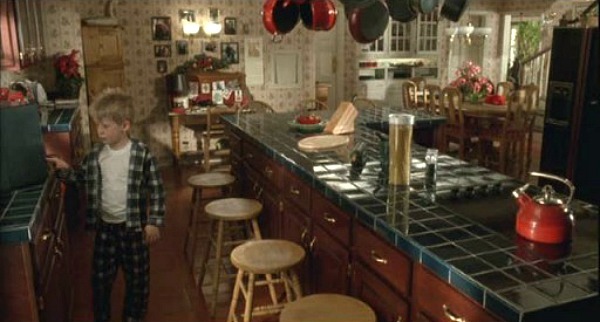 The walls match in the first movie where we see Jeff and Kevin standing near the sink and then in the second movie Kevin walks through his room to get his tie and Uncle Frank is in the shower. I assume when you get up the main staircase the bathroom door is straight ahead. If you turn left Kevin and Jeff’s room is on the right side of the hall. On the left side of the hall is the door to the back stairway and then the laundry chute and the parents bedroom is straight ahead. We never get to see Megan and Lenny’s room which is to the right before you get to the attic stairway door. I would assume the room we never get to see upstairs is the 5th bedroom in the real house which possibly might have a bath in it like the parents room does. The real house has 3.5 baths according to this site. 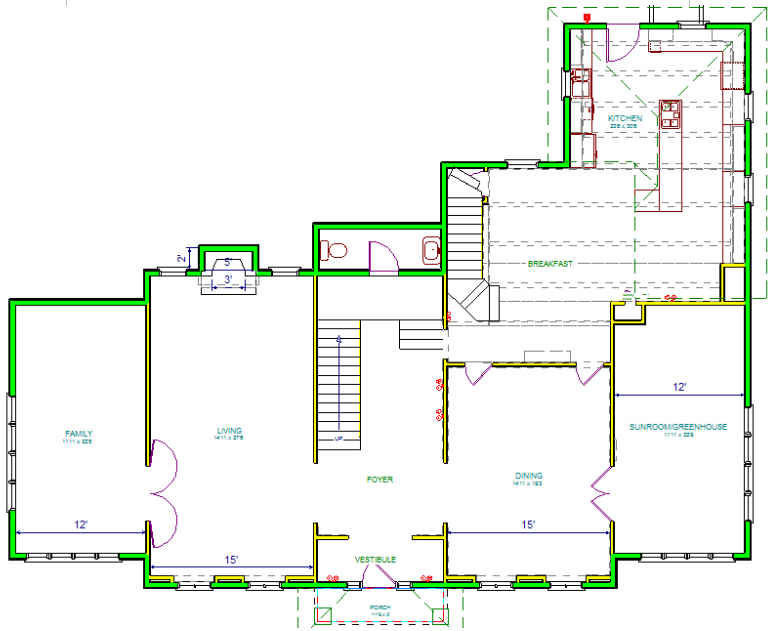 dr nikhil…that is my attempted floor plan. Your absolutely right about all your points. The french doors in the dining room, I assume, lead to the “sunroom” however it is never shown in the movie. Also, there are many discrepancies with the upstairs and this is where it becomes obvious that it is only a set (which is true, read above^). The third floor staircase blocks any hall access to the “mystery room” on the far upper end of the house. I placed doorways leading to it from buzz’s room and the back bedroom assuming its a play room of some sort? What it really is is a mystery since the interiors dont perfectly correlate with the exteriors. And yes, I dont understand where the bathroom from the sequel comes in. Its definitely buzz’s room if I remember correctly but in the first movie the hall bath is directly accross from the staircase in the center. This is one of my families favorite movies. Thank you for sharing the interior photos. I have always wondered what the interior looked like for the actual homeowners. When my boys were little, as a last resort sometimes I would take them in the car to get them to fall asleep. I would drive through the neighborhoods of Winnetka. It was perfect, they would fall asleep and I could wonder down the brick roads, looking at all the beautiful homes. Not only were the houses amazing, the yards were beautiful also. I always came home with so many ideas. .-= Susie´s last blog ..Preppy Finds =-. That’s a fabulous house, I wonder how much it costs *grins*. I really wish they kept the original cast and stuff throughout all of the movies. I don’t like the rest after number 2! Definitely classics though. Thanks for the great photos and info. Oh, what a lovely photos 🙂 I always love this movie and it’s so great that i have opportunity to see real interior of the house . Thanks a lot!!! .-= Kate@Florida country clubs´s last blog ..An Oceanfront Gem on the Florida Atlantic Coast =-. i love that house.the interior decorating is awesome . i wish i could decorate like that. I watch this movie when I was around 12 years old, back in Brazil. I dreamed of moving to North America since I was a kid and this house made me want to move here even more. This is an american house at it’s best. It feels like a house for everyone of the family and even after all of these years it’s simply delightful! I love reading your posts about “movie houses”, Julia. Thank you! Loved the movie, but how crazy is the person that thinks the extra looks like Elvis?! Did you do the house in Funny Farm? I thought I’d seen it here. 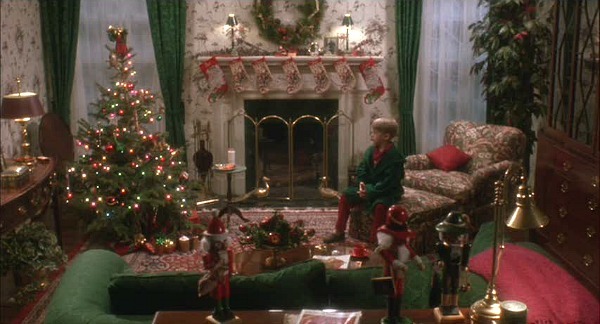 But the house is cute, and it really is a Christmas story because of the scenes at Christmas that finishes the movie. I watched this movie with my family in Germany in a small one screen theater on the military base. I would have been about 11 at the time. The line to get in went around the block and it was packed inside. It has to be the most fun I have ever had watching a movie. The audience got so involved; booing and hissing at the bad guys and clapping and celebrating when Kevin got the upper hand. I remember wishing for a home like that during the holidays. It was so perfect. What a great memory to have! I love that story–thanks for sharing it with us! I always thought we never saw Kevin’s bedroom either, until I watched the movie again yesterday and realized there is a shot of Kevin and Jeff in a bedroom at the beginning with bunk beds. I’m asssuming maybe Jeff and Kevin shared a bedroom maybe? I can’t believe I’d never noticed this before as many times as I’ve watched this movie. Great site and pictures. I always liked the house in this movie. This evening watching Home Alone 2, I noticed that when Kevin goes into the bathroom to get his tie while Uncle Frank is in the shower, he walks through what I think is his room (and Jeff’s) because you can see Kevin walk by the bunk beds. Apparently their bedroom has a door to the bathroom as well as access from the hallway which would make sense according to the house layout of the upstairs. Hi Julia! I love your site and loved this post about the Home Alone house! I had to tell you it inspired us to sled down our staircase just like Kevin did in the movie (yes I know it is crazy, but it was a blast!). We wrote a post about it on our blog https://hammersandhighheels.blogspot.com hope you get a chance to see it! .-= Carla ´s last blog ..Were Home Alone &amp Sledding Down Our Staircase! =-. What is the name and brand of wallpaper used in the hallway. Do you know if it is still sold? I have loved that wallpaper ever since I first saw the movie years ago. I absolutely love the ‘Home Alone’ house!!! This property was perfect for growing family and how I love to have this kind of property someday. I love the staircase, for me it was stunning and how I wish that Christmas is on my way. I love it. Thank you. Almost all of whatever you point out is astonishingly precise and it makes me wonder the reason why I had not looked at this with this light before. Your piece truly did turn the light on for me personally as far as this issue goes. Nonetheless at this time there is actually one factor I am not too comfortable with so whilst I make an effort to reconcile that with the actual core idea of your point, let me see just what all the rest of the visitors have to say.Well done.